I’m almost finished madly braiding a letterbraid to send in to the Braid Society’s Traveling Exhibition*—still fiddling with the braidlets at the end. 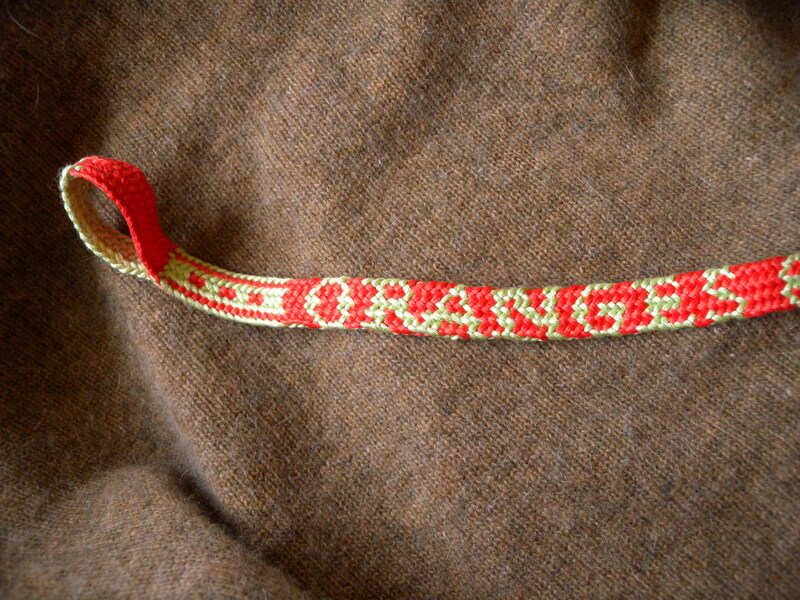 The orange is DMC cotton embroidery floss, doubled, so 12-strand, and the light green is an unknown brand of silk knitting yarn of similar weight (sport? or maybe thinner). The braid is a little over ½” wide. The color theme was “citrus” this year [this was Dec. 2010, for the 2011 Traveling Exhibition] . I’m usually pretty open-minded about colors, but I hated this theme—every combination of citrus colors I came up with looked terrible. Finally my sister helped me find two citrus colors that didn’t seem completely hideous together. (Sorry about the glare in the photos—in real life the orange is duskier, and the other color is a very light green.) When the color choices resolved down to 2, it dawned on me that I should make a letterbraid. I chose the quote for the citrus reference plus it has a little bit of the sound of some of the 17th C letterbraids. One of the manuscripts actually had text suggestions for letterbraids, all of them rhyming couplets (when this you see : remember mee). For me it also has a little ominous echo of George Orwell’s 1984. I decided that the braid would be a bell-pull, at least theoretically, since I don’t have a bell for it yet. *The Traveling Exhibition is less ‘grand’ than it sounds!—I’ve never actually seen it, but apparently it is a (non-juried) bulletin board of braids and bands representing the Braid Society that gets taken around by volunteers to textile and fiber-arts events in the U.K. in which the Braid Society has a booth. The Letterbraid book/monograph is not (primarily) a set of instructions, despite its title. Instead, it is about a set of instructions. It’s an analysis of several manuscripts with braiding instructions from the 17th Century. 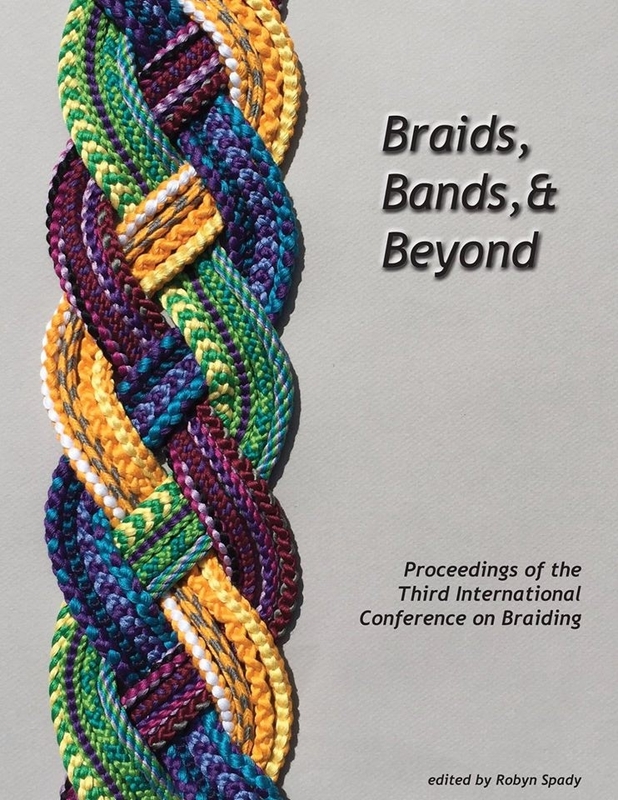 The main focus is how Joy Boutrup deciphered the three braiding methods, and a detailed analysis of the braids themselves. It does include very brief braiding instructions (hidden away in the appendices), with no illustrations of the moves. ← Welcome to Loop Braiding! What an inspiring site! Thank you for making your instructions and photos so easy to follow. Hi Anne, thanks for the feedback! I’m so relieved that you find the instructions easy to follow, I’m never sure! Thank you for promoting loop braiding!! I am impressed by all the braids you have been making. Also your fantastic letter braids. I have to tell you though, that Noémi and Masako do not like the name Fingerloop braiding. They prefer to call it just loop braiding or if very specific, loop manipulation braiding and when detailed, either “finger held” or “hand held” loop braiding. I was very happy to see the inventive tubular braid with the peepholes you sent me. just now I am working on the last issue of our series which will contain several small objects with interesting braids. Among them several special tubular braids and hopefully also an overview over the recipes for tubular braids. Thank you for all your work in this field and for promoting it. PS I use the plastic spiral back used for collecting sheet of paper. They have like little fingers, where I can park the loops in order when interrupted. Hi Joy, thanks for looking and commenting, and for your nice comments–and for rescuing the Letterbraids from oblivion! By the way eventually I plan to have a “resources” page on the blog that will include all of your and Noemi Speiser’s works, this blog is very new, I am still working on setting it up. I’m glad you reminded about the “fingerloop” term controversy–I have always used that term because to me it sounds so simple and clear. But I do use “loop braiding” for the overall category. 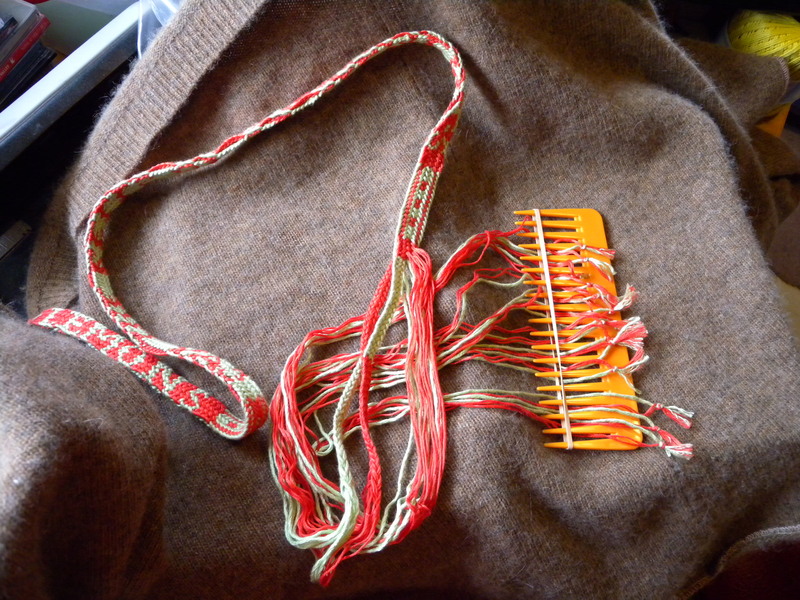 I am very interested in hand-held loop braiding too, Peruvian as well as Japanese. Maybe I should change my blog name, I will look into whether that’s possible. That is such a great idea to use the plastic notebook spines/holders! I will try that, I can imagine that popping the loops onto them would be very easy–and then they would be held on without needing a rubber band.